Castleton Hotel, where we stayed. Before this month I had never been to London, and Amy had only ever seen the inside of Heathrow Airport, so we used some United promo miles to book a “free” (after $212 booking fee) flight, reserved a room at the Castleton Hotel, and took a slow week off from work to hop over the Atlantic and do a cheap sightseeing trip. I’m normally used to peak-season, two-day, multi-leg, marathon trans-Pacific flights on crowded 747s, so the non-stop seven hour Wednesday flight from Dulles to Heathrow aboard a spacious and relatively empty 767-322 felt positively luxurious. On arrival, Heathrow Terminal 1 struck me as a bit run-down and oppressive, an impression not helped by the fact that only three immigrations representatives were on hand to handle a planeload of visitors — and when our turn came to be processed we were greeted with “Go back to the head of the line” by an unpleasant immigrations official who decided it was time to leave just as we reached his booth. 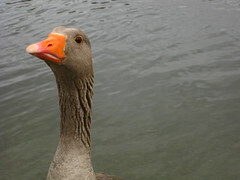 Thankfully after a few more minutes we ended up with a much friendlier representative who gave us a more proper welcome to the Kingdom. 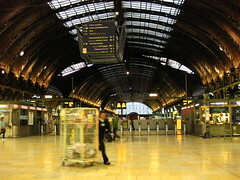 From there, the Heathrow Express was a quick 15 minute train ride to Paddington Station, a lovely rail terminal amidst a neighborhood of shops, restaurants, and rows and rows of boutique hotels along narrow, tourist-crowded streets. Castleton Hotel was at the corner of Sussex Gardens and London Street, just a block down from the station. The hotel had no lift or porter, and our tiny room was on the top floor, but we managed, and though it was midnight, restaurants and shops in the area were still open, so we managed to dine on a decent curry and buy some living supplies (bottled water and paper towels) before retiring to bed at almost 2AM. Thursday. 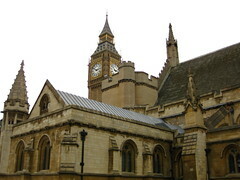 We planned to do the Old Westminster walk at 2PM but the day was yet young. 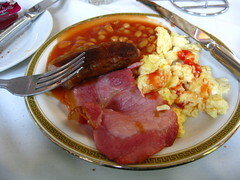 We started with a hearty English breakfast of eggs, bacon, sausage, beans, and toast in the hotel restaurant (free with the cost of the room), then got some British pounds at a Bureau de Change, bought Oyster cards at the Paddington Underground station, then headed down to Waterloo Station, where we rode the London Eye. 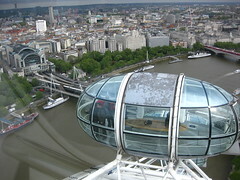 The Eye, a giant ferris wheel resembling a spoked bicycle wheel decked with spacious glass viewing pods, gave us a 30 minute ride providing excellent panoramas of the Thames, Westminster, Waterloo, and the rest of London for miles around. 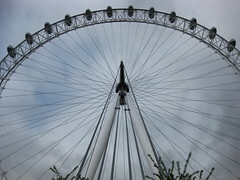 Even the Eye itself is a marvel of engineering to behold, the view of the wheel and neighboring pods giving a majestic sense of airborne scale. After the Eye, we had about two hours left before our walking tour, so we went to see the South Bank from London Bridge to Tower Bridge, with stops at Hays Galleria, Tooley Street, and some lunch at Cafe Amore. 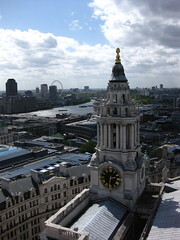 Then we crossed Tower Bridge, to Tower Hill Tube Station, and headed to Westminster to join the walking tour group. Ironically, the walking tour guide was an American from Wisconsin. 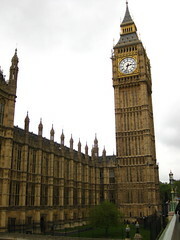 We saw Westminster Bridge, The Palace of Westminster and Clock Tower, St. Margaret’s Chapel and the Jewel Tower, Victoria Tower Gardens and the Buxton Memorial, and Westminster’s inner residential depths to see homes occupied by famous persons through history. After crossing the Westminster School campus we ended right in front of the Church of St. Peter at Westminster Abbey — which I did not realize you can enter. Instead, enticed by a group discount from the guide, we entered the Churchill War Rooms and Museum, and learned some British WW2 history. At the end of it all I had a greater appreciation for Winston Churchill but decided I would probably not have enjoyed knowing him personally, and in retrospect we could have skipped the War Rooms and just gone straight into St. Peter’s at the Abbey. Friday morning saw us at St. Paul’s to meet Mark. 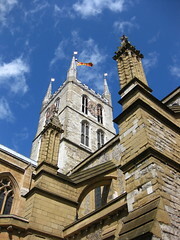 The Cathedral was sadly closed that morning for a Royal Navy event, but as we waited outside we got to see the arrival of HRH Prince Charles and Camilla, Duchess of Cornwall. I managed to get a photo of some Royal Backs before they disappeared into the nave. 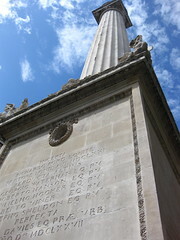 We walked over instead to The Monument, where for just 3 quid we could climb 311 steps to the top of the world’s tallest free standing Doric column to survey the city from 202 feet up. There was time left in the day, so we got back on the Tube and went to the British Museum to look at Mesopotamian, Sumerian, Assyrian, Egyptian, and Greek stuff, as well as The Intimate Portrait. 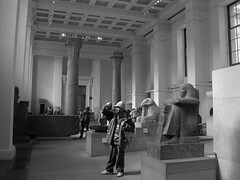 The afternoon light in the Ancient Egyptian hall was especially nice for photos of artifacts and tourists. After we’d had our fill of history, we went to Malabar for a dinner of curry and bread, then returned to the South Bank to do the rest of the walk from London Bridge to Waterloo before Tubing back up to Paddington to rest our tired legs. 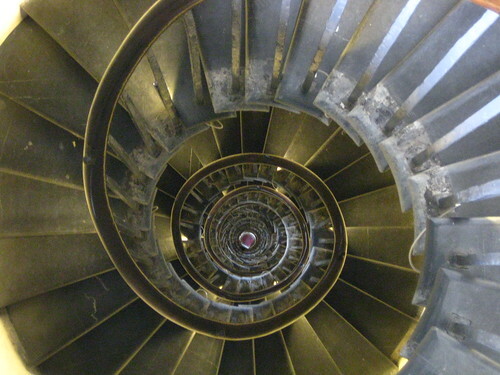 We must have done every single spiral staircase in London. We had intended to do the Tate Britain first thing Saturday morning, but it was so nice out that we decided to go the long route and stroll through Kensington Gardens and Hyde Park first. 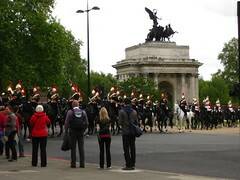 Along the way we saw geese and swan chicks and the Albert Memorial, and just before we descended into the Tube at Hyde Park Corner the Queen’s Life Guard paraded past on horses. 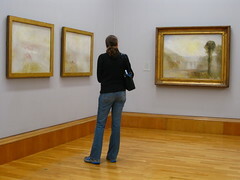 At the Tate Britain, we didn’t have time for the whole collection, so we focused generally on our preference: works from the 16th through 19th centuries, and JMW Turner. We then wandered a bit along the North Bank, looking for food, and settled for Pizza Express in Millbank, which turned out to be a good choice for their cured meats platter. Properly stuffed with pizza and prosciutto, we walked a bit further and found ourselves back in Westminster, and after a nice, relaxing sit on the grass in Victoria Tower Gardens, headed for the Abbey to see the parts of the Collegiate Church of St. Peter which we had missed two days prior. 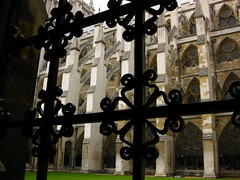 Westminster Abbey was amazing. Historic people buried all over (rather, under) the floor, the stones for the oldest ones worn smooth by centuries of footfalls. Here lies St. Edward the Confessor. 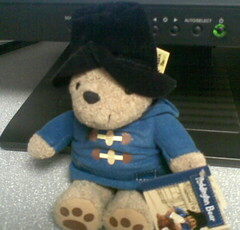 Here is Henry III. Here are Queens Elizabeth and Mary, side by side. Here are Chaucer, Shakespeare, Dickens, Burns, and Hardy. Outside, the Cloister, the Chapter House with the remains of its medieval wall paintings, even England’s oldest working door. History, moving and humbling, was all around and under foot. 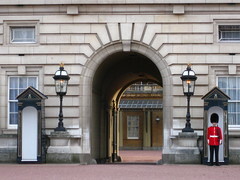 There was still some day left, so we headed for Buckingham Palace, hopefully with time enough to check out The Queen’s Gallery, but a wrong turn upon exiting Victoria Tube Station left us lost for long enough to miss closing. 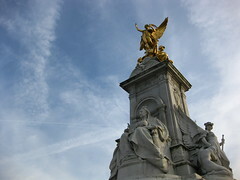 We did eventually find the Palace, however, and got photos of the Queen’s Guards and the Victoria Memorial. Feeling rather hungry by this point I got it into my head that the Portobello Road area would be a good spot for a bite — I was wrong. 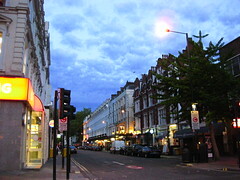 It was a bit late Saturday evening by the time we got to Notting Hill Gate Tube, and most Portobello Road establishments had closed up, except for one or two crowded pubs. We walked the area for almost an hour before I acknowledged to myself that perhaps Portobello Road is nothing like what was depicted in Bedknobs and Broomsticks. Instead we found some excellent pasta at Sugo right near Notting Hill Gate. 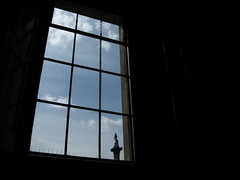 Tube to Charing Cross Station, ascend into Trafalgar Square, and we entered into the National Gallery. Even the non-modern art collection was far too large for us to view in a day, so we focused on medievals, Italian and Dutch masters (Vermeer and Rembrandt, especially), and Turner and Constable — with a break at noon to walk over to Leicester Square and lunch on fish and chips at a nearby patisserie. 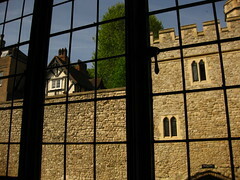 This took much of the day, but there was still time to check out The Tower of London in the afternoon. This took some Underground hackery, as the entire Circle Line and parts of the District Line were closed for weekend work. Instead we took the Central Line to Bank and walked the rest of the way to the Tower, with about two hours left before closing. 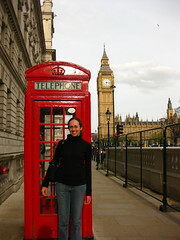 This turned out to be enough time, however, to see the main sights: the Crown Jewels, Medieval Palace, White Tower, and some ravens. The Crown Jewels were shiny and well-guarded, the Medieval Palace an interesting look into 11th Century royal living, the White Tower was being used for a display of Henry VIII arms and armour, and the ravens were eating garbage. 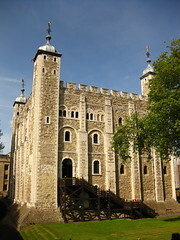 After the Tower of London closed, we looked a bit through the souvenir shop, then, with Tower Hill station still out of order, hopped on a Thames Clipper to Embankment, and strolled around Victoria Embankment Gardens a bit before getting on the Tube to Piccadilly Circus. Some wandering ensued, at the end of which we found an excellent pie house above The Crown pub on Brewer Street, where we ate hearty steak pies with mash and vegetables and bottles of Bulmer’s to wash it down — a perfect final London dinner. Checking out of Castleton Hotel, we learned from the front desk that they would have a lift installed by summer, which was good news, as it was the only drawback to an otherwise excellent stay. After some coffee and one last stop at the Paddington Bear stand, we got on the Heathrow Express to the airport for a smooth check-in. Security at the United terminal was excruciatingly punctilious, with a personal private one-on-one search of every passenger in a booth after the standard security cordon. I chatted a bit with the coffeeshop attendant, a longtime Filipina immigrant, before we got on the 777 to Dulles — a flight that was significantly less luxurious than the flight coming over, but we made it home intact. 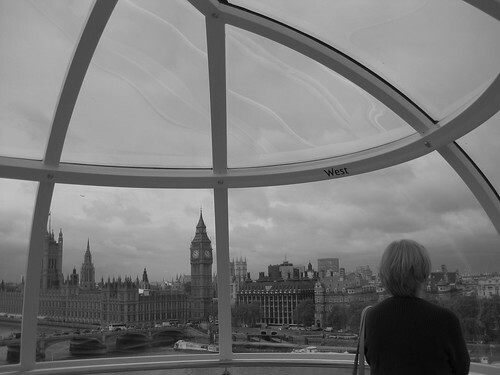 Five days in London, absolutely packed with things to do. We missed a lot of stuff on our “to-see” list (The Queen’s Collection, National Portrait Gallery, Windsor Castle, other MeFites and fellow internet friends — plus I hear the East End is so lovely that there’s a TV show about it), so you can expect that we will be back for more, hopefully soon and repeatedly.